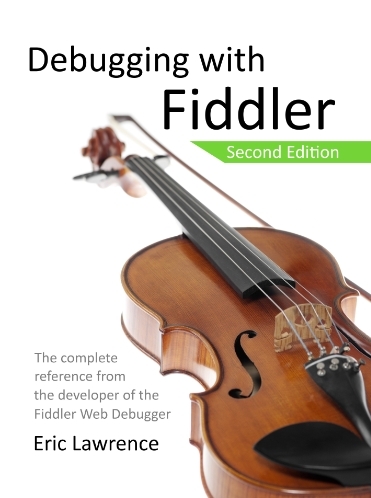 The fully revised and updated guide to the Fiddler Web Debugger. It's written by Eric Lawrence, the creator of Fiddler. In this book, you'll learn to fully exploit the power of Fiddler to debug traffic from virtually any web-related application, including all browsers and thousands of apps. You'll see how to debug HTTPS traffic, and use Fiddler with popular devices like iPhone/iPad, Android phones and tables, and others. After exploring the hundreds of built-in features, you'll learn to extend Fiddler using the FiddlerScript engine or build your own applications atop the FiddlerCore class library. You can download a free sample PDF containing the Table of Contents and a few pages to verify that the eBook renders well on your device. Pages with the most complex formatting were selected. Download the code from the book here. Please view and report errors in the book here. February 16, 2016 -- The eBook has been updated to v2.0.3 and now covers all of the improvements in Fiddler up to v4.6.2. All ebook customers can download the update for free from GumRoad. May 22, 2015 -- The second edition paperback has been published and is now available on Amazon. May 5, 2015 -- Unfortunately, CreateSpace has had some publishing problems and they're still working to get the second edition printed. The v2.0.1 ebook update was released on April 14th. April 7, 2015 -- Second Edition paperback (v2.0.1) is in review at CreateSpace and should be available for sale in about one week. The v2.0.1 update will be going out to Gumroad ebook purchasers around the same time. March 5, 2015 -- And we're live. The 2nd Edition updates nearly every page of the 1st Edition, covering the changes and improvements to Fiddler over the last 30 months since the original book's publication. March 2, 2015 -- The Second Edition should be available for sale on March 5th, 2015. December 2014 -- The First Edition was a best-seller on Amazon, but 30 months after its publication, it needs some updates. Work on the second edition is underway. If you bought the first edition ebook after June 1, 2014, get a free upgrade by emailing your receipt to the address on the copyright page.